Learn the best glute exercises for women and men. Glute exercises are important for stabilizing the hip and knee, and balance exercises that emphasize the glutes further increase hip, knee, and ankle stability. The gluteus medius and gluteus minimus are the smaller glute muscles on the side of the hip, and they are really important for stabilizing the hip, pelvis and knee. 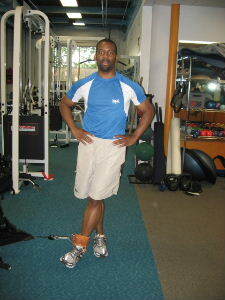 They both work when you stand on one leg, and they also works when you move your leg out to the side (hip abduction). 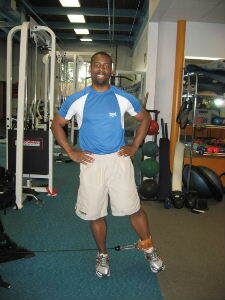 Below is a great hip exercise for the glute medius and minimus using a cable machine. Form: While keeping your knee straight, move your hip out towards the side. Hold for a brief second and then return to the starting position. Only move out as far as your hip allows without changing your posture. Cable exercises are some of the best glute exercises for women and men to improve balance and stabilize the knees. This is a great exercise for runners and people suffering from certain types of knee pain. Many of my clients do this exercise or a version of it, and I too include it in my own workouts from time to time.